Polyurethan, acrylic paint, lacquer, 21 x 8 x 9 cm. The multipel Rabbit is an attempt to recreate the origin of a pop-art classic; Jeff Koons similiarly titled sculpture in stainless steel from 1986. I rediscovered a film where I as a toddler played with a pink inflatable rabbit, and realized at last why Koons´ sculpture always has made such a strong impression on me. The rabbit I played with was almost identical with Koons´ sculpture, but not quite. 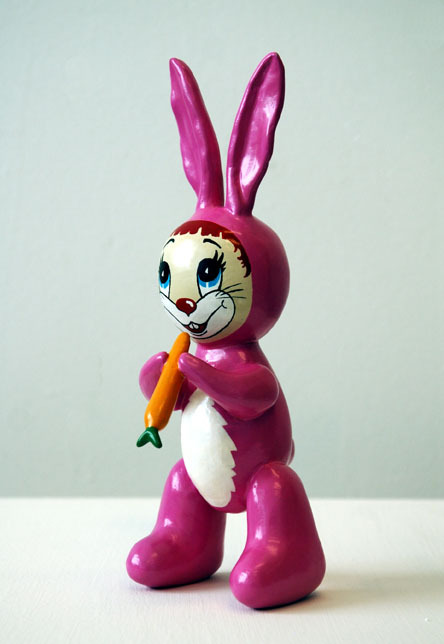 My version is therefore not a copy of Koons, but a faithful representation of a similar rabbit from my childhood. It is said that the first remembered memory of a life is a significant token of who you are. But what if your memories are based on photographic evidence? The rabbit is both an artificial memory, a fantasy toy animal and a postmodern art object. The innocent cuteness of the sculpture is obscuring the dark side of capitalism and the American dream. By re-making this allready made ready made, I wanted to take back what is mine, by making a better and more authentic rabbit than Koons. I also wanted to show that nothing will ever be the same. That every moment in time is unique, and ripe with endless meaning and possibilities. The sculpture is painstakingly modelled, cast and painted by hand. It is made in an edition of 12 copies.